The history of North Key Largo would not be complete without at least a mention of "Linderman Key." While presenting the little I know about Linderman Key, at the end I will mention the even lessor known "Grayvik." Together, both locations will show how little we have documented the history of the Upper Keys. I am kind of embarrassed to show so little, but there will never be more unless I start. If not familiar with the North Key Largo area please refer to the chart at the right. You will probably have to 'click' to enlarge the chart to read. Most of this information on Linderman Key I obtained from Pete Perdue, survivor of the 1935 hurricane, former owner of Perdue-Dean Marina former resident of Ocean Reef and now deceased. Other than possibly of the Tequesta Indians, the island's original owners were Jean (Thornton) and Bert Linderman. Bert was an American inventor/manufacturer of commercial brakes, wood machinery, etc. . The Linderman's had traveled the world and used the Florida Year-Round Club (later the Angler's Club) as their land base when in this area. I will insert here info from my later research on early Florida Year-Round Club's operations that there were two members, Bert and Jean Linderman, who donated two gasoline Delco electric generators for its operation s; therefore, I feel certain that they were the same Linderman family. Back to Pete, some time around the 1930s they started work on a magnificent two-story Spanish style main house with very elaborate wrought iron work. In addition, a guest house, staff house and a utility building for generator with banks of batteries and two huge water cisterns. Per Pete Perdue, the photo to the right was the mansion looking it from the water's edge. It was far enough up a small creek off of Broad Creek to have protection from the strong squall winds that occur without much warning. Bert named it Liars' Lair to relfect his love for fishing. With close examination the location of the house can be seen at the tip of the black arrow point in the chart above. Few will disagree that even with today's standards, this house with all its amenities was an opulent house. There were other early 1900s grand private residences in the Upper Keys. 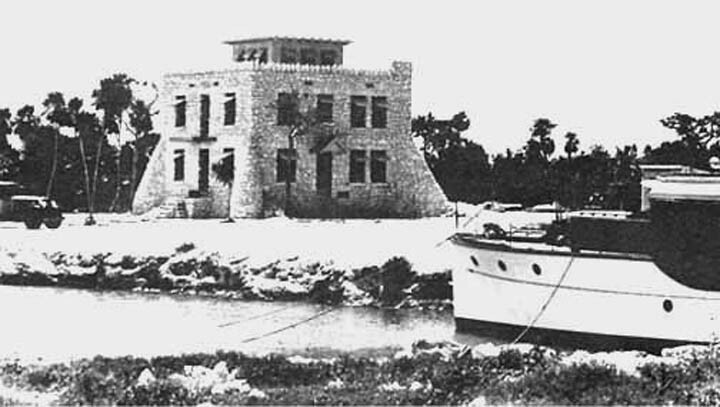 There is no surviving photo, but a Fargo, North Dakota resident and avid fisherman, W.A Scott, built a fine two-story coral-rock house several miles to the south which was expanded into the Key Largo Angler's Club main dining room. Another is the Key Largo Sound Dr. George Engel's house built in about the same time perio d - but without additional buildings. This castle home was styled after an European castle and survives today on Oceana Drive, just north of the Marvin Adams Waterway. These three and a 1940s built house in Marathon by a Harold Clark, is what I will label 'The Four Keys Mansions' outside of Key West. 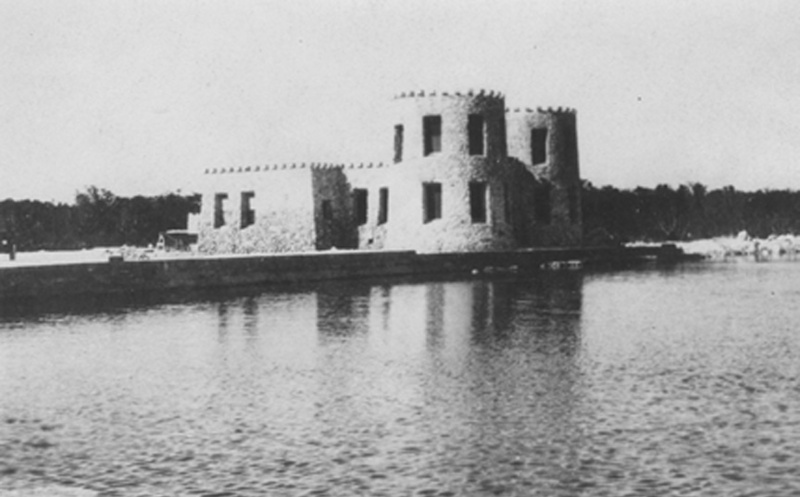 Below the Largo Sound Castle photo is a photo of another coral rock castle-like home was built for L. E. Goetz on Jewfish Key, Fiesta Key today (2005), allegedly around the same time period. Note a sizable boat tied to the dock and an automobile to the center left; therefore, this photo is post 1938. The Greyhound Corporation purchased the Key in the late 1940s and later a propane tank explosion damaged the house to the extent that it was torn down. Continuing with Pete Perdue's recollection, the Linderman's used the Grayvik Basin, now a part of the Ocean Reef Club and I do not have a photo of the house (More later), and the Key Largo Year-Round Club, not the Key Largo Angler's Club, as land bases to oversee construction of Liar's Lair. He believed Dr. Linderman died just before World War II and his wife, Jean Linderman took over the site. When WW-II, began, she became very involved in the U.S. Coast Guard Auxiliary and actually patrolled the waters herself. There were recollections of Jean's ventures with her 36 foot Chris Craft but few are recorded. 1) It was used by the CIA as a safe house known as 'Pirates Lair' and for maritime training operations. The safe house consisted of four houses dispersed on three-acre island. and that only one building could be seen from the deep-water canal. 2) The complex was used to teach Cuban exiles the V-20 boat, Boston-Whaler type vessels and rubber rafts with silenced motors assault techniques and operations. 3) The crafts were specially rebuilt to CIA specifications by South Florida boat yards so of which included reinforced hulls, armor plating, modified engines, electronic gear and hardened points to mount automatic weapons. Back to Pete's recollections, he said that shortly after the CIA pulled out, there was a terrific explosion in the main house. The explosion hurled bricks and steel beams clear across the island. Folks assumed it was plastic explosives left from the training camp set off as a grand finale to the failed invasion of the Bay of Pigs. "Miami Vice" and the Manos films shot scenes there. My thanks to Pete Perdue and now to the place that Pete referred to as "Grayvik" and misspelled by me in the above chart. People at Ocean Reef know the name "Grayvik," but that is about all. This chart is the sole primary documentation that I have of General Ivor Thorn-Gray building of "Grayvik." This is not to say that I cannot find plenty of documentation of Ivor Thord-Gray as the Internet and other sources have plenty. After many international escapades, 'in 1933, Thord divorced and on 11th June 1933 married Winifred Ingersoll (1884-1960) and settled down in Miami. 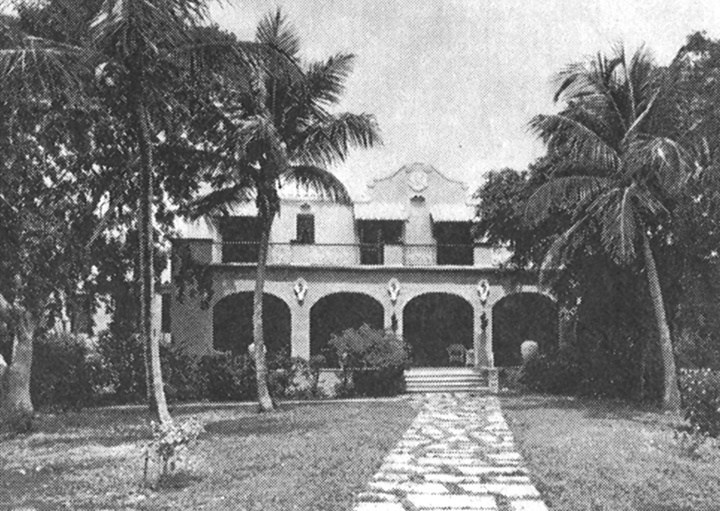 When his house Grayvik on North Key Largo was destroyed in a hurricane, the family moved to Coral Gables, Florida.' A Swedish researcher feels that 'Grayvik' would be an appropriate Swedish name that he would have given. This places Thord-Gray in Miami and he could have easily built a place on Key Largo where the Ocean Reef Club will originate in 1944. 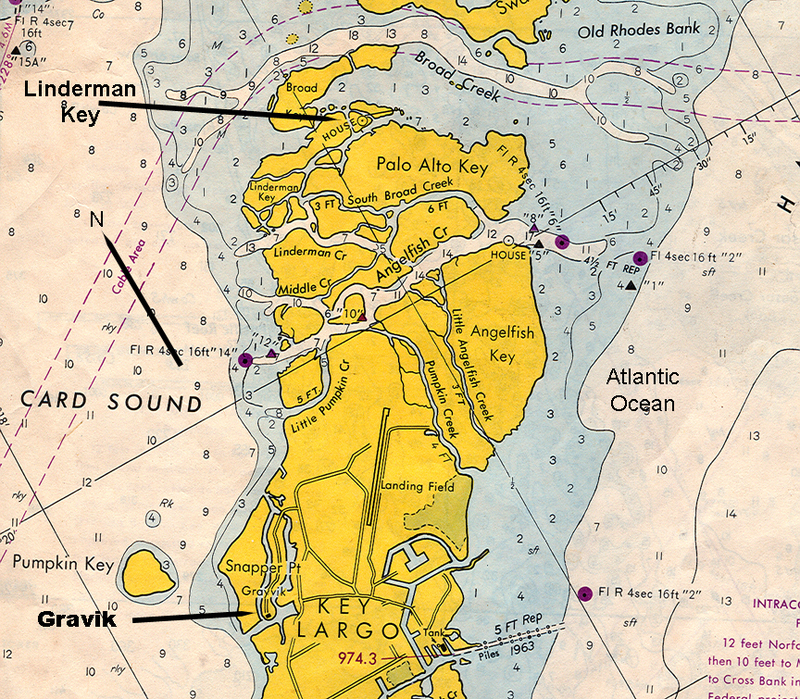 Ocean Reef does have a street named Grayvik and it is on the narrow peninsular shown on the chart above. What is more there is documentation that on 8 April 1935, he became 'Major General of the Florida Militia and Chief of the Personal Staff to the Governor of Florida, David Sholtz,' yet I cannot find anyone in Tallahassee who even remembers the name. The great Labor Day Hurricane of 1935 could have been the hurricane that destroyed his house at Grayvik, if so I think that he would have made an appearance. Very interesting as well as very elusive. NOTE: If you entered this page from the link from the "Upper Keys Schools" page, USE THE RETURN ARROW to return the your previous page location.